On Friday 17th November, staff at XL Displays took part in a Where’s Wally themed fundraising day to raise money for Children in Need. The fun packed day saw the team at XL Displays raise over £220. Every year we show our support to Children in Need. In 2015, everyone dressed up as their favourite childhood heroes and 2016 saw the whole team come to work in pyjamas and slippers which was a obvious favourite for the team. The VR competition brought out people's competitive edge and even saw staff with zero experince in VR, having fun. 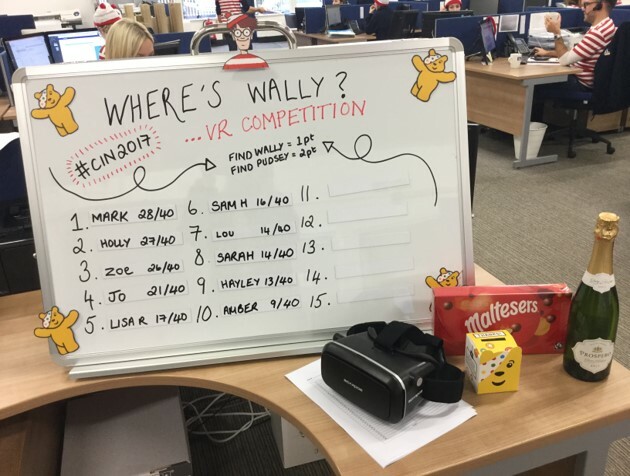 The VR competition consisted of a pre-recorded 360° video with a total of 35 hidden Wally's and Pudsey bears. Each member of staff had to find as many as possible using the VR headset to take first place on the leader board. Our most competitive team member, Mark, took first place and took home first prize - Well done Mark. We would like to thank all of our staff for their support and participation and we look forward to our next charity fundraiser which is Save the Children Christmas Jumper Day on Friday 15th December. For more information about any of our fundraising efforts or to find out more about our exhibition and display products please contact us or call 01733 511030.